As you begin to teach the American Revolution, students must understand something clearly: once the thirteen colonies had been established and were evolving and growing, England recognized their economic value. 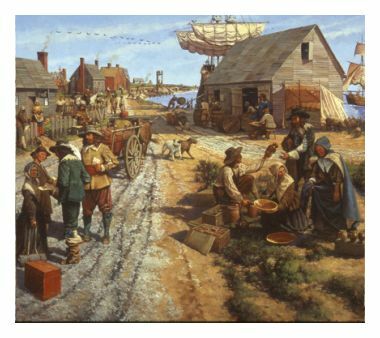 The colonies provided cheap raw materials to England and markets for England's manufactured goods. It is crucial that students "get" this before moving on. The only problem was that England treated the colonies much like the Masters in the colonies treated their slaves: as property; property whose sole purpose was to serve the Master/Mother Country. Ironic, isn't it? Before long, the colonies began to resent England's treatment of them and complete disregard for them. Complaints were made to the king repeatedly, but they fell on deaf ears. The colonies wanted to be represented in England's Parliament so that they could vote on decisions that affected them. When England began to tax the colonies for ridiculous reasons, their only objective to make money, the colonies had had enough. They cried out, "No taxation without representation!" Still, England ignored them and the colonies began to think of independence. Thus began the American Revolution. To supplement this unit, check out recommended films and books at the Teach with Movies or the Teach with Literature pages on OwlTeacher.com. If you need any additional materials that are not provided here, simply fill out an order form at the Custom-Created! page. To gain a deeper understanding of unit 3, especially through primary sources, read about the American Revolutionary War in stories at this amazing site. A list of important key terms that relate to America's struggle for independence. This is an excellent PowerPoint presentation on unit 3; it includes 90 detailed and colorful slides to help you teach the unit to your students. This activity helps students to understand some of the Acts passed by Great Britain that eventually contributed to the revolutionary war. In this project, student have a lot of fun learning about the different key figures of unit 3. It has always been a huge hit in all of my classes! A grading rubric for the project above; allows students to see how they will be graded and makes it easy for you to do the grading. A study guide to prepare students for the test; I always make mine a mandatory assignment. It's been proven in my classes time and time again: if students complete the entire study guide, they do well on the test. An exam composed of a mix of term matching, multiple choice, and information recall with short answer questions and essay questions. The essay questions demand students to put important elements of the unit into their own words, showing thorough understanding.